South Los Angeles is a 50-square-mile area within the city of LA with a lot of strengths and a lot of challenges. Many residents of this community are underserved, which means in part that they have little access to green space, safe recreational opportunities or healthy and affordable eating options. As a result, many community members struggle with obesity, heart disease and other health-related conditions in percentages disproportionate to other areas of LA with better access to resources conducive to community health. As is the case in many underserved communities, sometimes creative solutions meet opportunity and the results can be transformative. Zumba, the Latin dance-inspired exercise craze began in Colombia in the 1990’s by Alberto “Beto” Perez. As the popularity of these classes grew internationally, the demand for Zumba teaching certifications also grew, and in response, Perez created a one-day long workshop for aspiring teachers. 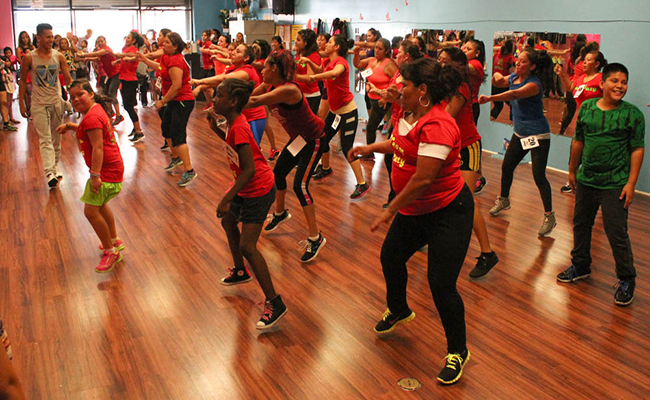 In the last few years almost 40 Zumba studios have found their way in to unlikely places such as parking lots, beauty parlors, swap meets, and storefronts, allowing residents to take advantage of more conveniently located exercise opportunities creatively housed in their neighborhood.